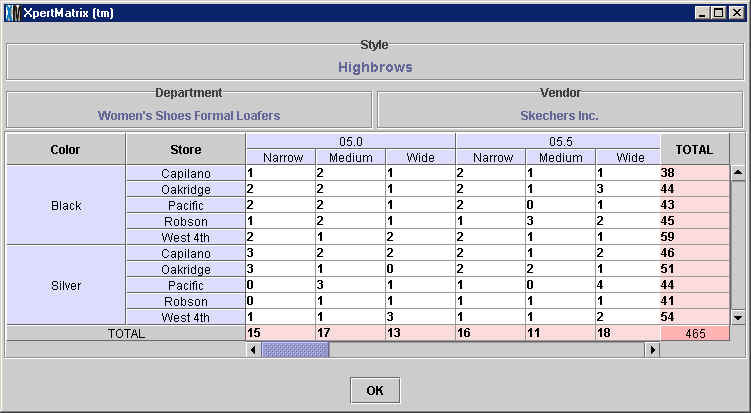 The XpertMatrix™ displays the stock on hand for a certain style in a Color/Store/Size/SecondSize matrix. The XpertMatrix™ offers a dynamic way to quickly see your inventory and spot where you may be overstocked or understocked. For example, a sales clerk in a store where the items are sold out, would open the matrix to see if the sold out item is in stock anywhere else in the chain.XpertMatrix™ is launched by pressing the matrix button on the toolbar in any catalogue: . The size of the XpertMatrix™ can be adjusted by moving the cursor to one of the corners of the window. The contents displayed automatically adjust to the size of the window; scroll bars will appear along the bottom and along the right side if the window becomes smaller than contents being displayed. 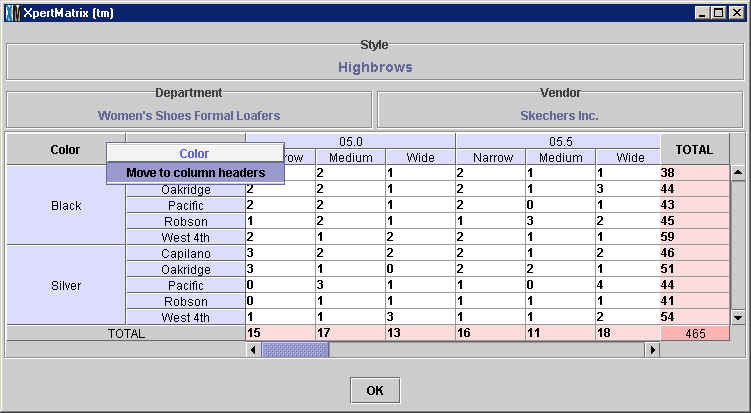 The width of the columns in the matrix is configurable and can be adjusted in the Document Screens Tab of the Station Configure menu. You can also adjust the width of any column temporarily by clicking on the border of the column and dragging it to its desired size. (To temporarily adjust the width of all columns, press the right button of the mouse and click on Select All in the menu that appears before adjusting the width of the column). 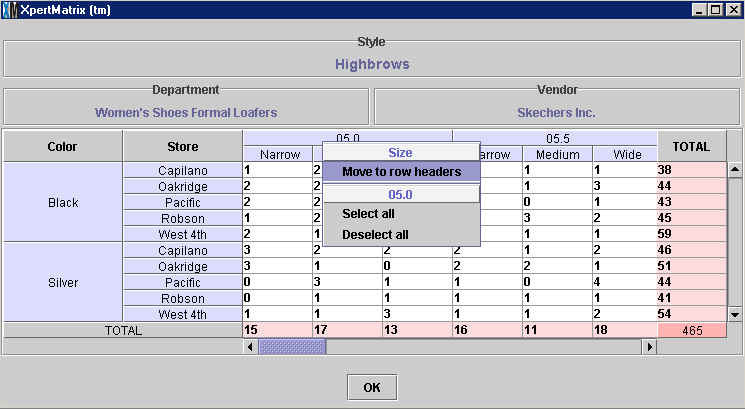 The XpertMatrix™ window shows the name of the Style at the top (the Highbrows style in the example above) as well as the Department and Vendor it belongs to. 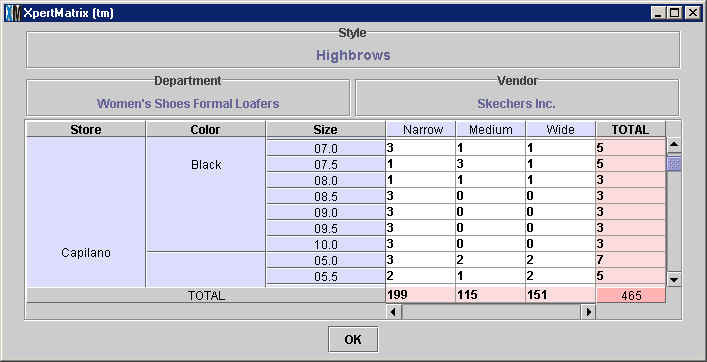 In the basic display, the colors that the style is available in are displayed in rows along the left. 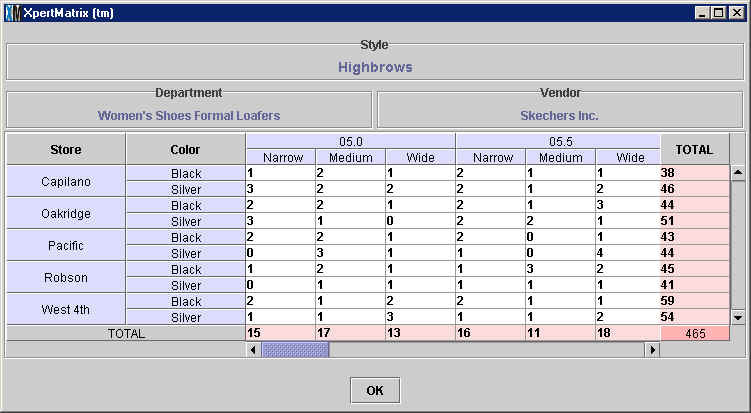 In the example above, you can see that the Highbrows loafer is available in Black and in Silver. Also in the vertical axis, next to the Color rows, all of the stores in the chain are displayed. In this case, there are five stores: Capilano, Oakridge, Pacific, Robson and West 4th. 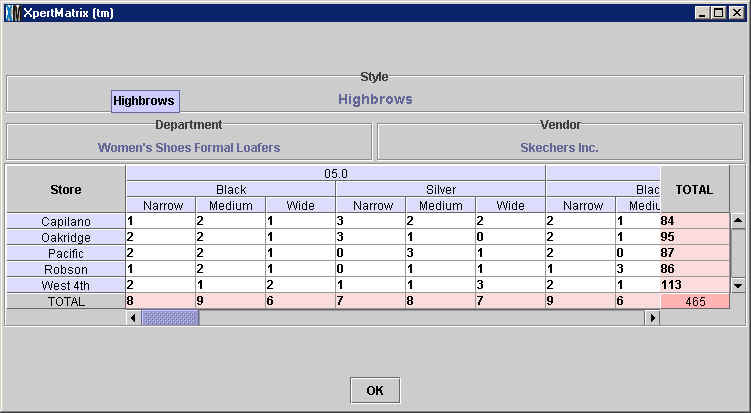 Along the horizontal axis you see first the sizes the style is available in, and then the second sizes. In this case, the Highbrows loafer is available in sizes 5.0 - 10.0 and each Size comes in one of three Second Sizes: narrow, medium and wide. The Second Size is optional and many matrices will only show the Size along the horizontal axis. Every combination of a color, a store, a size and a second size creates a cell in the matrix. Every cell in the matrix represents an item and the number in that cell shows the current stock level for that item. In the above example, there are currently 3 Silver Size 5.0 Narrow Highbrow loafers in stock in the Oakridge store and 2 Black Size 5.5 Wide in the Robson store. When there is a zero in a cell it means the item is out of stock, as is the case with the Silver Size 5.0 Narrow at both the Pacific and Robson stores. If a certain Color/Size/SecondSize combination did not exist then those corresponding cells would appear in gray. Along the bottom and the right-hand side there are subtotals appearing in cells shaded pink. The pink cells along the bottom show the total of a particular Size/SeondSize combination. In the example above, there are 17 Size 5.0 Medium loafers in stock in all five stores in the chain, in both colors. The pink cells along the right show the total of a particular Color/Store combination. For example, the image above shows that there are a total of 59 Black loafers in the West 4th store in all sizes and second sizes. The cell in the bottom right-hand corner shaded dark pink shows the aggregate total for the style. In this case, there are a total of 465 Highbrow loafers available in every size and color throughout the chain. 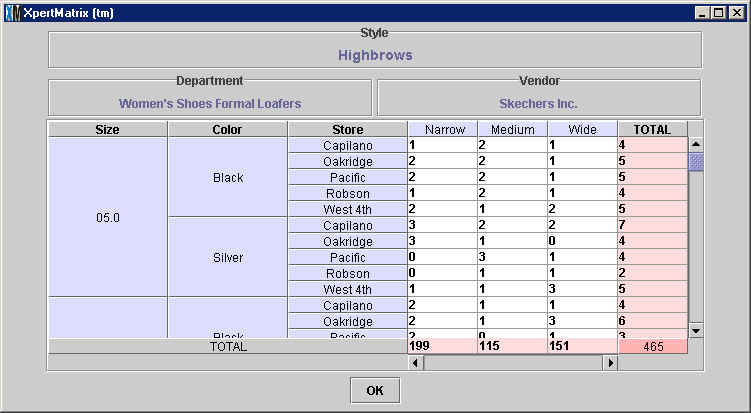 You can now visualize stock information primarily by store. The totals displayed in the pink column to the right will still match the ones displayed before (after all, the stock levels have not changed) but the order has been changed. 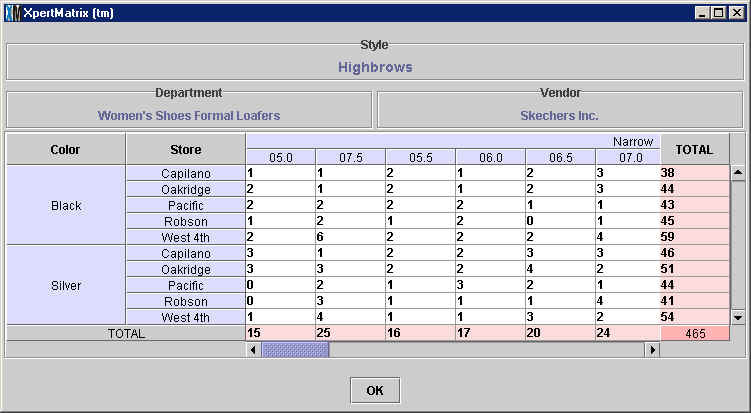 Notice, for example, that the total number of Silver loafers in the Capilano store, 46, remains the same, but is now displayed as the second pink cell from the top and not the sixth from the top as it was before. the stock levels for every Size/SecondSize combination. The XpertMatrix™ now shows the stock data by SecondSize/Size pairs: all of the Narrow sizes are shown first, followed by the medium sizes and so on. The totals displayed in the pink row at the bottom will still match the ones displayed before, but the order has changed. The Size 7.5 Narrow stock column is now next to the Size 5.0 Narrow stock column for easy comparison. Notice that the total in pink (25 pairs) has also moved. The Size will now appear as a row, alongside the Color and Store rows. This is a useful way to isolate the SecondSize dimension as you can now see subtotals for Narrow (199), Medium (115) and Wide (151). As discussed in the previous section, you can change the order in which the rows arranged. In the example above, the information along the vertical axis is predominantly orderd by Size. However, you could rearrange the display so that the information is primarily displayed by Store by clicking on the Store column header. Similarly, any column can become a row. To do this, right-click over any row header and select the Move to column headers option in the menu that appears. In the example below, the Color row is being moved to a column. The total stock levels for each store have now been isolated. You can now see, for example, that the West 4th street has a lot more stock than the other four stores. If each store had received the same number of Highbrows loafers, this might be a matter of concern. The point is that by changing the way information is displayed, a new insight was suddenly made available.